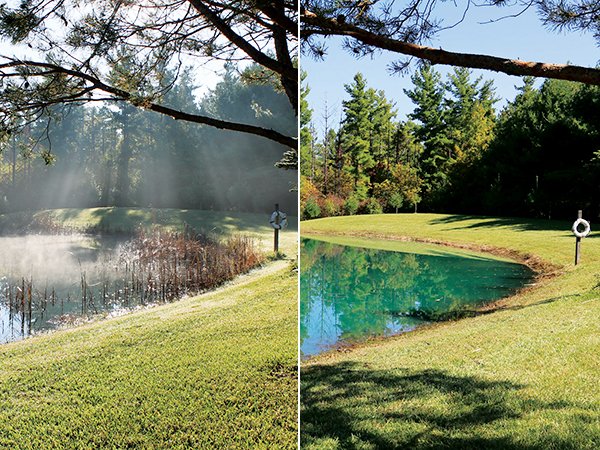 The Pond Guy® is here to take the lead in ensuring your pond is cleaned and maintained properly. To maximize the effectiveness of remediation, we spray emergent growth that is at least 12”-18” above the water’s surface. A systemic herbicide will kill the emergent weeds down to the root to prevent the plant from re-growing. Our new argo sprayer allows us to reach even the most overgrown area. We use lightweight, specialized equipment to avoid damaging existing landscape taking special care to remove these emergent weeds and give you back your pond. Offsite removal of debris may also be available. Most cattail and phragmites removal services are completed with one day. Any removal of dead debris from a pond is beneficial. Pulling dead weeds, algae and decaying leaves from the pond will aid in slowing down muck build up while discouraging mosquitos, rodents and other predators. Debris removal will also help with pond odors and oxygen circulation giving your pond a more aesthetic appeal and better accessibility for pond activities. We use lightweight, turf friendly, equipment to avoid damaging existing landscape taking special care to remove these emergent weeds and give you back your pond. Offsite removal of debris may also be available. Once my weeds are cut will they regrow? We will cut down any dead debris from the pond however this does not stop the root system from re-growing. Emergent weeds that are still living will need a minimum of two treatments prior to cutting. Emergent weeds have an extensive root system and it make take several cycles of growth before all root systems can be killed. Will I see weed stubble sticking out of the water? Special underwater cutters are used to cut the plant off below the water’s surface as low as possible. Will the equipment used wreck my lawn? Turf friendly equipment will be used also with hand tools to minimize any damage to pond surroundings.